Eight Korean films will take center stage at the City to City sidebar of this year’s Toronto International Film Festival, which will run from Sept. 4-14. Seoul has been selected as the “cinematic hotspot” to be highlighted at this year’s City to City program, which introduces films and filmmakers from a selected city. This is the sixth edition of the festival’s City to City program, which has previously focused on Tel Aviv, Istanbul, Buenos Aires, Mumbai and Athens. While some of the films have already received world acclaim, others will be screened for the first time at the festival. Romantic thriller “Scarlet Innocence,” directed by Yim Pil-sung (“Hansel and Gretel”), will have its world premiere at the festival. A-list actor Jung Woo-sung plays Hak-kyu, a university professor who is gradually losing his eyesight and falls for 17-year-old Deok-yi, played by rookie actress Esom. Their sudden attraction turns into to an obsessive love as their fates are intertwined. The film is adapted from the classic Korean tale “The Story of Simcheong.” However, it has a different vibe from the traditional story as “director Yim takes radical liberties with the story, changing what was always a father-daughter dynamic into an account of two strangers who first become lovers, then adversaries,” commented Bailey, who chose the selection. “Yim has always set his characters free to pursue their obsessions no matter how far it takes them,” said Bailey. 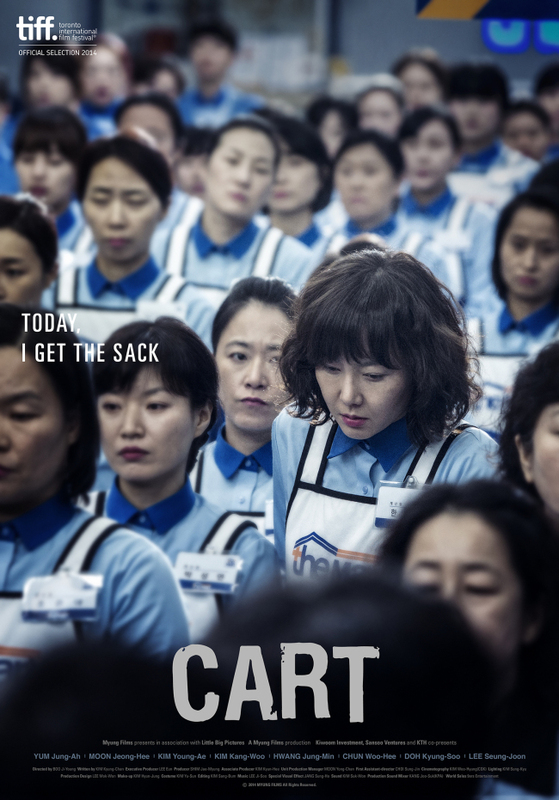 The drama “Cart,” directed by Boo Ji-young, is also making its world premiere. The film centers on the employees at a large discount retail store, who fight for their rights against the company’s exploitative practices. “Director Boo weaves these issues into her story in an engaging, accessible way, capturing the galvanizing spirit of female empowerment,” said Bailey. Six other films that have already received high marks from international festivals and audiences alike are included in the selection. Multimedia artist Kelvin Kyung Kun Park’s documentary “A Dream of Iron” depicts South Korea’s rapid industrialization of the 1960s, then examines the drive towards modernization and its consequences, while July Jung’s “A Girl at My Door” addresses many sensitive themes, including child abuse, alcoholism and women’s rights. The other films to be screened are the crime thriller “A Hard Day” (Kim Seong-hun), drama “Alive” (Park Jung-bum), action thriller “Confession” (Lee Do-yun) and drama “Gyeongju” (Zhang Lu). “When it comes to film, Seoul is a city that never fails to produce new talent and surprising works of art,” said TIFF international programmer Giovanna Fulvi of the selections. Other Korean titles, including Im Kwon-taek’s “Revivre,” Hong Sang-soo’s “Hill of Freedom” and “Sea Fog” by director Shim Sung-bo and executive producer Bong Joon-ho, will also appear in the festival. The 39th Toronto International Film Festival is regarded as one of the most influential international film festivals along with those in Cannes, Berlin and Venice. For more information, visit www.tiff.net.